41 1/2 by 52 by 48 in. 105.4 by 132.1 by 121.9 cm. 76 1/2 by 87 3/4 194.3 by 222.9 cm. 62 5/8 by 57 1/2 in. 159.1 by 146.1 cm. 59 1/4 by 77 1/2 by 41 3/8 in. 150.5 by 196.9 by 105.1 cm. 93 by 71 by 5 in. 236.2 by 180.3 by 12.7 cm. 38 1/2 by 32 5/8 by 2 1/8 97.8 by 82.9 by 5.4 cm. Mitchell-Innes & Nash is pleased to present Sarah Braman: Yours. The artist’s first show at the gallery will feature several new sculptures and wall works. 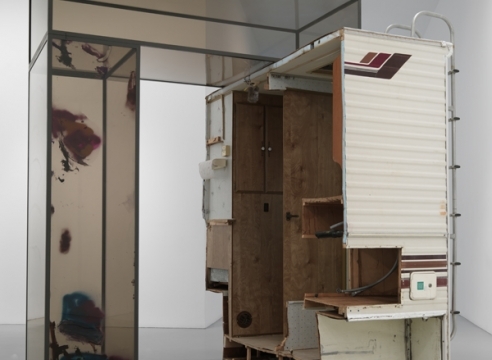 For this exhibition, Braman has deconstructed an entire camper and incorporated slices and chunks of it into a number of different works. The resulting sculptures collapse inside and outside in a way that’s funny and uncanny, familiar and resolutely odd. Braman’s sculptures are monuments to everyday life, and to the interplay between sensory experience and emotional resonance. 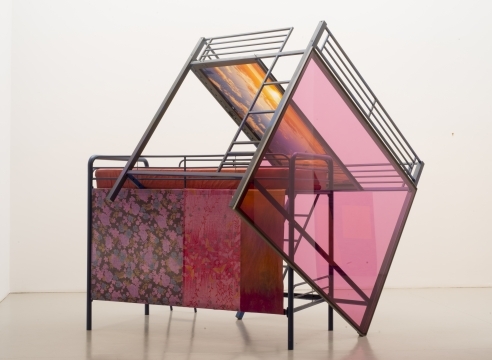 She combines parts scavenged from vehicles, old buildings, or furniture with translucent volumes of color and light to construct her precariously balanced sculptures. 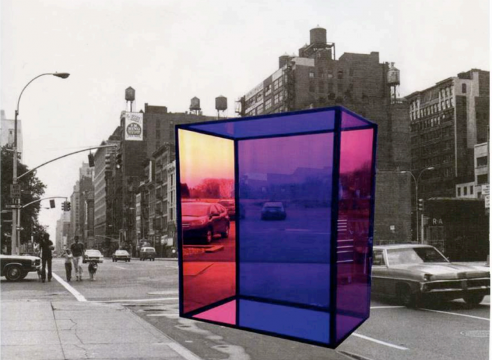 In their formal construction, they relate to the legacies of minimalism and color field painting. Yet they defy modernist tunnel vision with their joyful immersion in lived experience and emotional life: they suggest themes of home, family, and nature. Braman's use of materials also takes this dichotomy as a governing principle: colored plexi serves purely as a vehicle for light, volume, and color, while wood and cardboard bear evidence of use and wear. Braman’s sculptural works are always experienced in the round, yielding multiple vantage points and endless variations. In creating these ever-shifting points of view, Braman asks the viewer to take an active part in creating meaning: the exhibition's title, Yours, connotes an offering or a salutation, but also alludes to the viewer's role in the work. Sarah Braman has exhibited in museums and institutions in the US and Europe. Her first European solo exhibition was on view in 2011 at MACRO in Rome, Italy. She was included in the 2010 Lisbon Biennal in Portugal and 2005 Greater New York at PS1 Contemporary Art Center in Long Island City, as well as exhibitions in Copenhagen, London, and Berlin. She has had New York solo exhibitions at Canada and Museum 52. She received her MFA from Tyler School of Art in Philadelphia in 1998, and her BFA from Maryland Institute College of Art in Baltimore in 1992. The story behind the artist's work, in her once words. In 1969, Shasta Trailer Industries--then the best-selling mobile-home manufacturer in the United States--introduced a new product: the Loflyte. 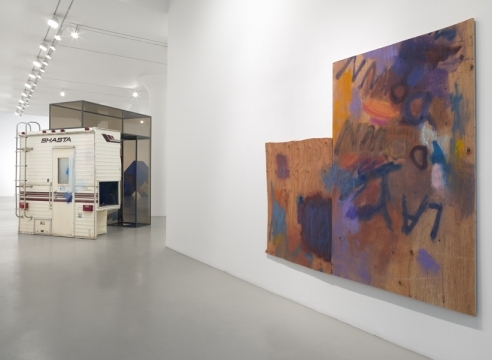 In her fourth solo in a New York gallery, Sarah Braman continues the confident development of her loquacious, hardscrabble formalist assemblages.